With last week’s opening of Satchmo at the Waldorf, which premiered at Le Petit Theatre, the 2018-2019 theatre season is officially upon us here in the Crescent City. Visiting the theatre can, at times, be an intimidating activity to participate in; more formal than attending a concert, and with a more traditional decorum than going to the cinema. The best way to get comfortable? Knowing the “what, when and where” of shows around town. Fortunately, River Beats has you covered: check out our 2018-2019 Theatre Guide to get the scoop on some of the best shows coming to New Orleans this season. Le Petit is one of, if not the most historic playhouse in the city. Known nationwide by its full name Le Petit Théâtre Du Vieux Carré, this venue has played home to a phenomenal stage program since 1916. Its current location placed just off of Jackson Square on St. Peter Street has been hosting shows since 1922. The theatre covers a wide array of genres: from dramas to comedies, to musicals. The Little Theatre’s exciting lineup for this season features a one-man, three-act play focused on a New Orleans legend (Satchmo), as well as the playhouse’s first-annual rendition of A Christmas Carol. Visit Le Petit’s website for more information, here. The Nola Project is a playacting company which advertises itself as “Theatre for the Bold”. We here at River Beats couldn’t agree more. The ensemble-company works to create fresh, engaging shows based on both new plays and classically great works, and does so in some of the trendiest venues around town. In 2017, the Nola Project won honors from the Gambit as “The Best Local Theatre Company” following a “National Theatre Company Award” by the American Theatre Wing. With an ensemble cast of 35 artists ranging from New Orleans to New York, The Nola Project brings inspired works of live-acting to places like the circa-1903 tavern known as Little Gem Saloon, and the sculpture garden at NOMA. This year’s schedule includes a world-premiere showing of work by an off-Broadway hit writer (Stockholm Syndrome), and a spinoff story based in Shakespearean lore (The Henchman). Check out The Nola Project’s website here for more information. The Southern Rep Theatre has been a hub for plays and live theatre since its inception in 1986. The theatre company’s mission is to inspire equity, diversity, and inclusion in its projects and shows. Apart from the works Southern Rep produces, the theatre company offers “Care for Creatives”, a program which focuses on wellbeing and healing hours for the artistic community. The Southern Rep Theatre Company also produces a monthly show know as “Debauchery!”, a live, ongoing comedy soap opera. The 2018-19 schedule for Southern Rep includes several regionally premiering shows, as well as several world premieres from New Orleanian playwrights (Azul, Flowers for Halie). Find more information about Southern Rep here. The Tennessee Williams Theatre Company is passionate about three things in particular: Theatre, New Orleans, and Tennessee Williams. The company claims as its’ mission a commitment to producing engaging, captivating plays sourced from the work of Nola’s most famous playwright. The Tennessee Williams Co. works to foster and cultivate a relationship between the people of the Crescent City and Tennessee Williams, by offering the chance to see his works just how he wrote them: boldly and poignantly. Learn more about the Tennessee Williams Theatre Company and their upcoming shows here. The Saenger Theatre of New Orleans is one of the last existing locations of a once-great line of theatres across the country. The theatre is a true place to behold if you’ve never been. 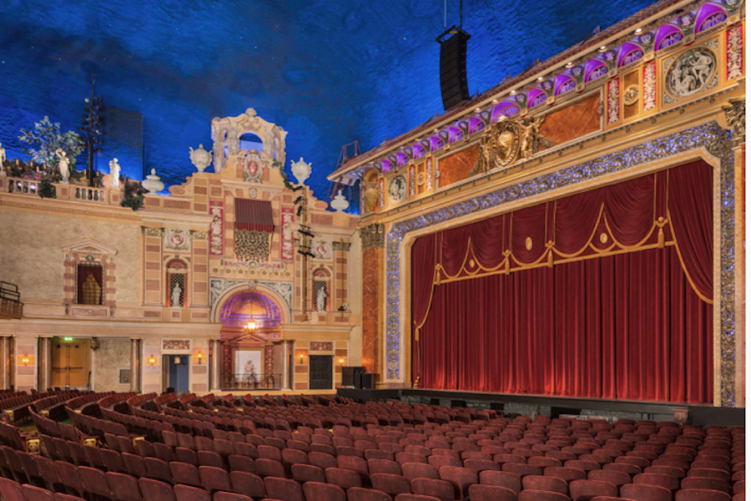 Restored and reopened in 2013 after Hurricane Katrina, the Saenger boasts a powerful stage-system that is renowned across the country. Its reputation has provided it the opportunity to host some of the best theatre works out there, stacking the upcoming schedule with an impressive lineup that includes Hamilton, the Book of Mormon, and even a few showings of Elf. Check out the Saenger’s Musical lineup here. From playacting to musicals, the 2018-2019 Theatre Season lineup looks to be especially outstanding for New Orleanians this year. Be sure to follow River Beats for the latest news about upcoming events across the Crescent City. You’re going to not want to miss these shows! Great article! What is the “once great line of theaters”? Were they all Saenger theaters?